Hello folks. Architect Eric Corey Freed tweeted about this infographic and the accompanying critique by Mother Nature Network. 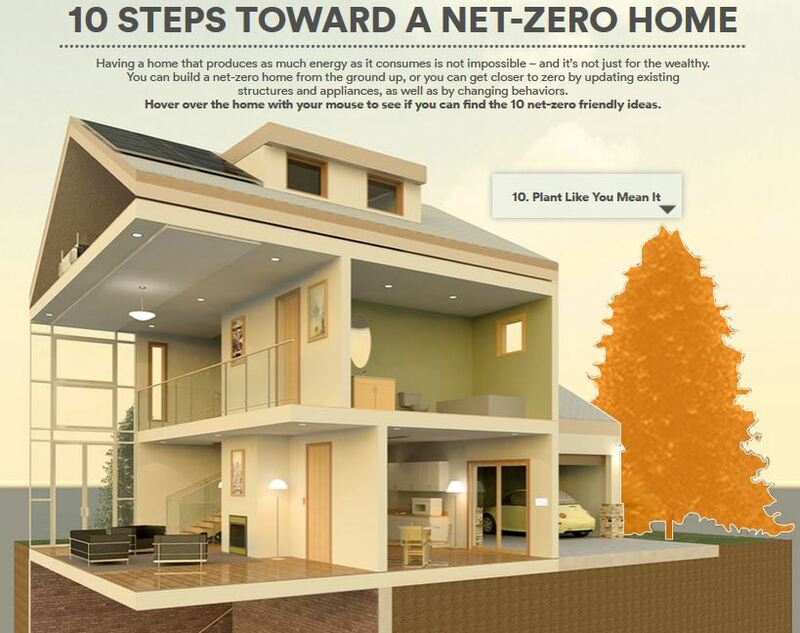 Just like Mother Nature Network, I like Vivint’s infographic but for a real Zero Energy Home, you’ve got to go further. Even Mother Nature Network’s critique doesn’t go far enough for the Vermont climate. Nonetheless, it’s a neat way to package the info. Here’s Efficiency Vermont’s Zero Energy Home infographic. 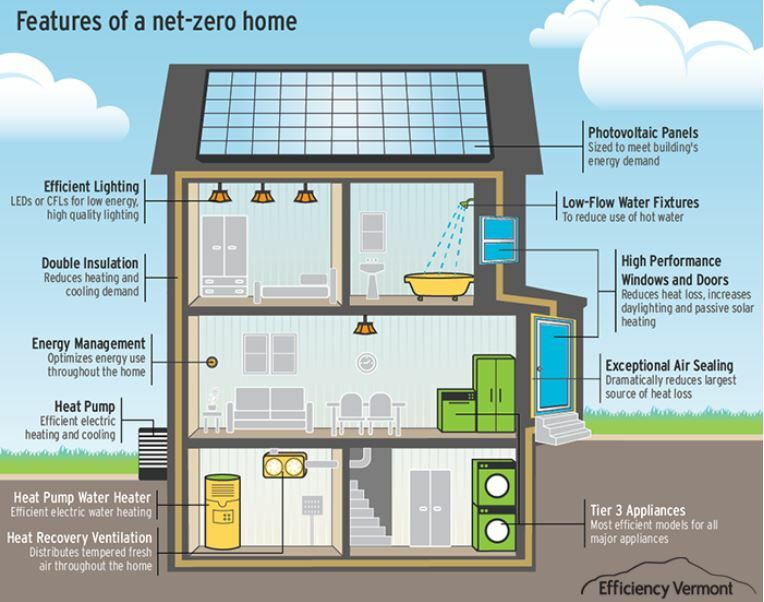 What would you put on your Zero Energy Home infographic? Zero Energy, For All Kinds of Reasons, and It’s Cheaper! It gives you a chance to take care of all the regular maintenance items that you have to deal with periodically: replacing the roof, residing, replacing the heating system… And to leverage that expense to reduce your home’s operating costs. Problems like a wet basement, mold, poor air quality are fixed in the context of a large-scale project like a Zero Energy Home. Excellent air quality is a hallmark of an energy efficient and high performing home. The residential sector is the one place where you and all your neighbors can make a meaningful change in how much energy you use. If we all go Zero Energy, we’d wipe out one-third of Vermont’s energy consumption. Wow! Vermont has a statewide energy plan that is admirable, aggressive, and not on track to meet any of its goals. Nonetheless, Zero Energy Homes can be part of Vermont making good on a very important part of our future planning. Homes that have had good, big energy work done are more resilient in the face of disruptions to essential services. A Zero Energy Home is the most comfortable home you’ve ever experienced! And, when you consider all the benefits of living in a Zero Energy Home, often it costs less to operate your home this way rather than continue to pay your electricity and fuel bills. I have felt privileged to help many folks find the least cost way to operate their home, and to get on the path toward Zero Energy. One of the underlying concepts along the Path is that everything is on the table to consider as a tradeoff in pursuit of keeping costs down: everything except health, safety, durability and comfort. Here’s an interesting case where the owner considers another tradeoff that a solar system offers. Enjoy! For 7 years running Northeast Sustainable Energy Association has offered a $10k prize for the best zero energy building in the northeast. The application deadline is coming up. 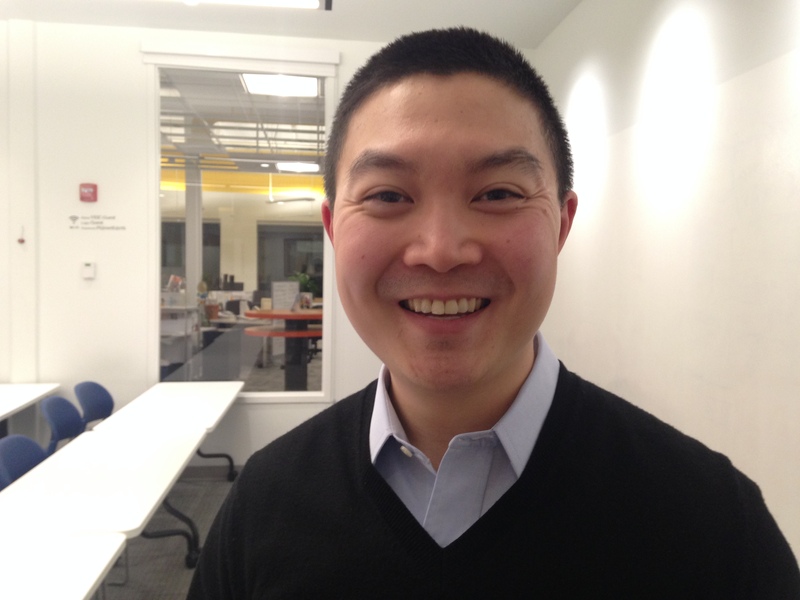 Retrofit projects are strongly encouraged, and affordability is an important criteria. Apply here. Best of luck! 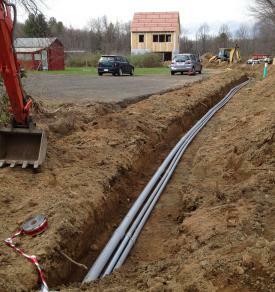 Here’s a neat story about saving lots of money on heating fuel with a mini-split heat pump. At the risk of permanently taking up the Chicken Little mantle, let me say here’s One More Chance to get a great deal on a solar electric system. A recent report from LBNL and NREL predicts that PV prices will continue to go down! In June I urged those thinking of buying a PV system to do it soon because the Vermont renewable energy incentive fund was about to run out. Later I learned that the Renewable Energy Resource Center had decided to restructure the incentive going forward with the effect that there will no longer be a state incentive for regular residential PV systems. Good news, but short lived… Following the decision to eliminate the residential PV incentive, a million dollars was placed into the incentive fund to be available through the end of 2014. So, the residential incentive is still going away, but you do have a few more months to take advantage of the current incentive, which is $0.25/kW, or about $1500 for a normal-sized home PV system, and $2500 for a zero energy home-sized PV system. Can you still get a PV system installed in 2014? Yes, but time is short, and as weather gets more inhospitable for roof work, remaining work days will start to evaporate. It’s now or not-quite-as-affordable! Hot water has long been an intractable energy hog in efficient homes. With the new generation of heat pump water heaters there is finally a more affordable alternative to solar hot water: a technology handicapped by weather, copper prices and high maintenance moving parts. Older plumbing may use large diameter pipes that leave a lot of hot water stranded in the pipes when you shut off the tap. Heat pump water heaters use electricity very “efficiently”, and are a good match with a renewable electricity system, like solar PV. It’s a mature technology that does what it promises and is surprisingly affordable. However, heat pump water heaters need specific installation requirements to be a good match for your high performance home. Basement or far enough from the living area that the noise of the compressor is not bothersome. 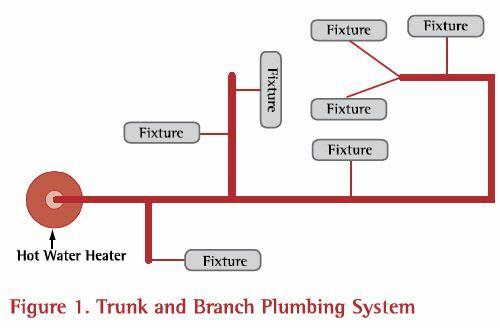 A home run plumbing layout uses small diameter pipes because each pipe only serves one fixture. 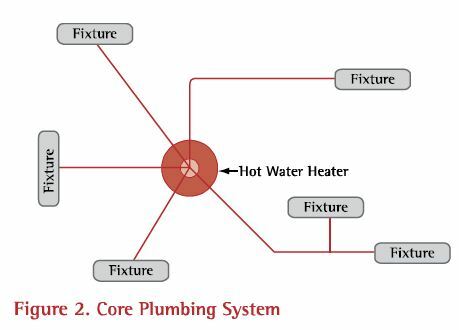 Small pipes keep stranded hot water to a minimum. A heat pump water heater isn’t for everyone, even if you have the extra renewable electricity to operate it. Efficiency Vermont’s High Performance Home Team has put together a water heating alternative for homes where a heat pump water heater would perform poorly or make a localized comfort problem. 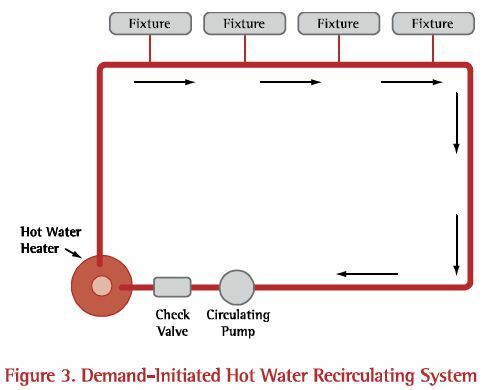 A demand recirculation system uses a pump to push the stranded water in the pipe back to the water heater, while delivering hot water to the tap fast. This approach helps conserve water but only does a little bit to save water heating fuel. In an existing home some of these things may be cost prohibitive, like replacing all the pipe between the water heater and the bathrooms. But they work as a package to ensure that the relatively low “efficiency” of the water heater doesn’t gobble up too much of the annual energy budget. If you have to give up too many of these elements, say you are unwilling to replace your clotheswasher, it’s probably better to go with a heat pump water heater and just operate it as an electric resistance water heater for a couple of months a year. Water conservation is the easiest, cheapest, fastest way to save water heating energy, and it adds up fast! After you’ve trimmed your water use, then think about how you’re going to heat the water. While the water conservation approaches above are very important if the water heater is an electric resistance one, they are still a good idea for keeping your water heating energy low even if you are using solar hot water or a heat pump water heater.